The cryptocurrencies’ market cap fell by $60 billion in less than a week, after another Bitcoin mini-crash gave start to widespread rout. The rapid liquidation of cryptocurrency portfolios has resulted in other major assets, such as ETH, LTC and XRP, falling in price to the lowest level since December 2017. At the time it was suggested that behind the world’s bet on revolutionary technologies there was only a cascade of speculative transactions and hunt for easy profit. Last night, the BTC fell to $ 4,237, its lowest level in the last 13 months, then stabilized at about $ 4,500 on Wednesday. From the point of view of basic technical analysis, the main support for Bitcoin can be found at the weekly 200-moving average (200-sma) at the level of $ 3130. The level of $ 3,130 may be the last big fortress for bulls to fight back. But if it fails, it will become clear that the speculative bubble has passed into the terminal stage and long-term shorts will likely be the major play. Low BTC volatility, prompt calls on the dips and various rally attempts have created the impression for a stable market for a relatively long time, however, the looming storm was indicated by the market capitalization that does not include Bitcoin. Since May, the market has steadily lost in volume, and over the past two months, the pace has slowed down, which has restrained gloomy sentiments. In addition, large stock exchanges such as Binance cut off the connection with fiat currencies, therefore Bitcoin served as a kind of internal fiat (protective asset) and at times of rout of other digital assets it naturally strengthened in price. It’s funny, but such a restriction created a transactional demand for bitcoin (demand as means of payment), while other cryptocurrencies performed like goods in our ordinary economy. The only problem is that over time awareness has grown that most of them have neither consumer nor investment value. But the idea or the forced measure to close the cryptocurrency system and make it a real and independent digital economy, with its goods, extended its life for some time. Interestingly, despite the stabilization of the price of Bitcoin in the summer at around $ 6,000, the complexity of mining continued to grow. There is evidenced that the hashrate began to decline only in October of this year. In other words, mining efforts increased, while increasing the natural supply of Bitcoin, albeit at a falling rate. Since mining has operational costs (electricity, air conditioning, etc. ), with BTC price stuck in tight ranges and increasing complexity, mining should remain profitable until marginal revenue equals marginal costs. That is, until the moment when the next mined and sold bitcoin will not cover the costs of it. As envisioned by Satoshi, the mining infrastructure of the miners was to become the technological basis for processing the transactions for which the miners would charge a commission. But the only miscalculation was that Bitcoin won’t be widely adopted as a means of payment, so mining remained mostly speculative all this time and the share of revenue from commissions was low, except for the really active period last year (again speculative). As I said above, the difficulty of mining is directly proportional to the computational efforts (and electricity!) spent on it. With the fall of the difficulty, the natural increase in supply will slow down, easing the pressure on prices. This is one of the few positive factors. But following the simple reasoning above, the remaining capacity will continue to supply new BTC to the market, trying to pay off or take the last profit. A speculative supply among other factors will likely lead to the next downward spike in demand. The next portion of capacity will go to junk, which does not pay for itself. 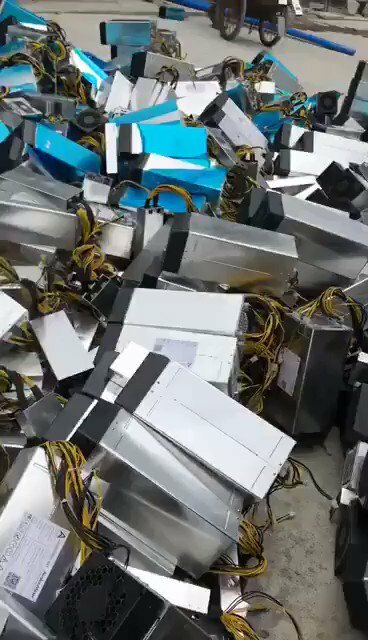 Thus, the system sets itself to self-destruction, miners in the struggle for a shrinking profit rate lose the infrastructure necessary for processing transactions. And new ones will likely not be built, while old ones could be sold first. Asian stocks sank on Friday, because despite the enabling environment for a meaningful dialogue between the leaders of China and the US in Argentina, the escalation of trade war remains on top of the risk list for the markets. Weak corporate reporting in Europe heightened concerns about the growth of the Eurozone, but progress in Brexit does not allow pessimism to outweigh market sentiments. American markets were closed yesterday on the occasion of Thanksgiving, so trading activity was thin. After opening, Chinese markets pulled local indices down as blue-chip stocks in China declined by more than 2% today. Shares of Chinese companies seem to be “stuck” in a downtrend, as US tariffs and high debt burdening the corporate sector have become a painful combination of risks for shareholders, causing flight to safer assets, i.e. cash. The growing number of corporate defaults in China suggests that the authorities are yet to find a balance between stability and efficiency and the strengthening of one of the parameters inevitably leads to a deterioration of the other. In the trade confrontation with the United States, the Chinese economy still suffers larger losses than the US, for example, activity indices in the manufacturing sector in China (manufacturing PMI) indicate a decrease in production volumes and a drop in export orders. The October reading showed that the manufacturing sector in China is hardly above the line which divides growth from a downturn. Seoul’s Kospi fell by 0.6%, Hang Seng, following mainland China, was trading in negative territory. Australian stocks rose 0.5%, but in the weekly perspective they are in the red zone for the second week in a row. On Thursday, European stocks were under attack as corporate reporting disappointed the market, indicating that, in addition to domestic demand, companies also had problems with external demand. US tariffs have created imbalances in the supply chain and European companies have a harder time selling their products to foreign consumers. Domestic demand continues to be in a dormant state, as the ECB’s easing program has not achieved significant results in stimulating household lending. A draft on future relations, prepared by British and European diplomats, should have become a sign that the parties are making progress in the process of England’s exit from the EU, but May’s inner-party opposition does not allow any progress in foreign policy to be considered reliable. Especially if there is no political consensus inside the country. In the foreign exchange market, the pound stabilized slightly above 1.2850, jumping 1 percent on Thursday, amid news that England and the EU presented a draft agreement that describes future relations between the two countries. It became the second document after the draft of Brexit, which brings Britain closer to the exit from the block, a process which has been going on for more than two years. But the documents must be approved in the British Parliament, which is divided into camps and where there are Euro-skeptics and pro-European parties and various opportunists seem to be ready to exchange a voice for a benefit. Voting in the British Parliament will take place in the second week of December, so until that time the pound is left to wave the volatility, as now there is a fertile environment for rumors. US stock futures indicate a weak start on Wall Street today. Asian markets kicked off the week with moderate growth, futures for US indices also show a little optimism, as investors are preparing for the meeting of Xi and Trump in Argentina, preferring to dodge possible unwelcome outcomses in the safe heavens. A little support is provided by expectations of solid consumer sales in the US during the holiday season, as a counter-argument we can mention the lackluster survey data from U. Michigan, which showed that rush in optimism was probably left in the past. The meeting between the leaders of China and the United States in Buenos Aires, which will be held this week, and the Fed meeting in December remain the two major market-moving events for December. The broad MSCI index, which includes Pacific stock indices, rose by 0.7%. Hong Kong and Taiwan led gains, while the Japanese Nikkei gained 0.8%. In China, the Shanghai Composite Index started the week from strengthening, but closed Monday in a small loss trying to defend the psychologically important level of 2500. During the Asian session, futures for the S&P 500 pulled up by 0.4%, as traders gradually adjust valuation estimates according to potential economic impetus from Black Friday sales. The S&P 500 fell by 0.66% on Friday or by 10.2% from the annual peak reached on September 20th, amid oil prices falling, which hit the US energy sector. On Friday, the price of WTI approached $50 per barrel – the lowest since October last year. Today, the prices are likely to hold a session in the technical correction; during the Asian session, prices rose by almost 2%. It is expected that with the decline in prices, American oil firms will have to slow down the rate of production, while, Saudi Arabia may make adjustments to its plans to restrict production in December, which it has evasively discussed. Based on this, the news background can gradually be filled with positive rumors and news, and trying to short the oil is very risky, because you can get into a global reversal. It is noteworthy that the pace of decline in oil prices is comparable to 2008 (almost 21% in just 1 month), so winter will probably be accompanied by a global “cooling down” of inflation, which should be reflected in the speeches of officials of large central banks. In particular, energy prices were an important component of inflation in the eurozone, and the ECB President Mario Draghi had already promised to curb QE, but at the last meeting he gave a signal that the ECB could change its mind. US President Donald Trump and his Chinese counterpart Xi Jingping are expected to hold informal talks at the G20 summit in Argentina later this month. In my opinion, the leaders of the two countries will still be able to agree on what we can probably find out through easing Trump’s rhetoric on Twitter and more positive messages in Chinese state media. Now that the effect of tax reform is dwindling, the Fed is not going to slow down the pace of rate increases, and the stock market is depressed, the new wave of tariffs will not pass unnoticed by the American economy, and Trump probably understands this. Peter Navarro, the main “hater” of China in the White House, was excluded from the list of those who will attend the meeting, which was an indicative step on the part of the United States that they would try to circumvent sharp corners in negotiations with their Chinese colleagues. Eurozone activity indices from Markit showed on Friday that services and production slowed down significantly in November. The euro responded with a decline of 0.6% on Friday, stabilizing around 1.1360 on Monday. German bond yields have declined, indicating a growing risk aversion in the market. The British Pound barely responded to the news that the European Union agreed with the British “best possible” options for Brexit at the summit of EU leaders on Sunday. The market will closely monitor whether the deal will go through the split British Parliament, which will vote on this issue on December 13-14. Jeremy Powell’s speech at the New York Economic Club is scheduled for Wednesday. The weighted average dollar index DXY has been trending upwards from the end of September and a fair question is where the end of the rally is. I am not a big fan of technical patterns but applying a quick sketch of channel lines on the chart we can see a rather clear resistance point, at least from where bidding on further rally may be a mentally hard decision. Of course, it makes sense if we assume that the medium-term trend, we are talking about has some inertia. Such resistance could be expected at around 98.00 points. What led the dollar here and what drivers are there for the American currency to grow further? Considering the situation with a “bird’s-eye view”, discrepancies in the fundamental picture of the market arise when assessing the three next points: the economic outlook for the United States abroad, the state of the American economy, and the Fed’s policies related to it. The collapse of oil prices by more than 20% from $80 per barrel to $50 steals the so-welcomed inflationary impulse from developed economies. This is especially clearly seen in the Eurozone and Japan and may contradict the commonplace view that lower oil will help firms to save up on costs. If we chart together the yield on German 10-year bonds and the oil price, it is evident that energy prices somewhat lead the yield movement in the Europe’s fixed income market. In continuation of my Thursday discussion about the stock market rally, volatility responded curiously to Powell’s speech on Wednesday. Usually, the VIX and S&P 500 move just the opposite (although with different amplitudes), but on Wednesday there was a moment when the 9-day expected volatility (VXST) rose despite the 2% gains of S&P 500 which is very unusual. Usually, the VIX and the S&P 500 move in different directions, since, roughly speaking, panic and the accompanying increase in volatility is inherent in a rather bear market (“market goes up by stairs and down by elevator”). Interestingly, this movement has not been observed on the market since 2011. The dots on the chart indicate the daily changes in VXST (9-day volatility), in those days when the S&P 500 grew by more than 2% per day. On average, VXST fell by -17%. One of the possible explanations for what happened is that some market participants did not buy at the rally initiated by Powell, as they are waiting for the results of the Trump-Xi meeting, which I wrote about yesterday. Despite the increase in fiscal and monetary support in recent months, the activity of the manufacturing sector in China fell to 2016 low and is on the verge of contraction. The main indicator was 50 points in November – the value of separating recovery and recession. The service sector in China is also not yet able to take on the burden of growth – activity in it slowed to 53.4 points in November against expectations of 53.8 points. The weakness of debt-addicted economy cannot be eradicated even after a fresh stimulus package- income tax cuts, credit support for financial organizations in order to pour this money into enterprises through stocks and bonds. The size and position in China in the global economy will guarantee the recession echoes will feed into the PMI data of other countries, primarily in the EU and the US. Their PMI gauges is expected to be released next week. The minutes of the Fed meeting, which appeared yesterday, could seem irrelevant knowledge to the markets in the light of Powell’s communication on Wednesday, but the statement language convinces that concerns about growth in 2019 has been already gaining momentum at the beginning of this month. First, the officials urged to be more attentive to the incoming economic data. They said that in the upcoming meetings, in the content of the statement and the wording, it may be appropriate to place more emphasis on economic data in economic assessments and policy forecasts. That old and well-known “data dependence” narrative which pervaded Yellen’s comments and which Draghi cannot yet get rid of. This is the exact caution motive which may serve as fundamental ground for expectations of only one rate increase next year (in fact, to the lower limit of the neutral rate estimates by the Fed). Secondly, after a series of previous statements about strong, robust growth, first signs of Fed concerns about the economy were concentrated around slowdown in “some rate-sensitive sectors” in the November statement. Most likely this is the real estate market and possibly the construction sector related to it, the data for which were absolutely not impressive this year. Since March 2016, the 30-year mortgage rate has risen from 3.6 to 5.2%. Stock markets reacted slightly, the dollar changed was flat. Futures on the interest rate point to the same probability of a rate increase in December, while we are waiting for the results of the Trump-Xi meeting. The meeting of Saudi Arabia, other members of the cartel and Russia ultimately produced only a recommendation to curb production, without a formal agreement on how much oil should leave the market. Representatives of the OPEC countries hit the wires with comments on Wednesday on how important it is to cut production now, and the Russian representative confirmed that the meeting was constructive, but the result will be announced at a meeting in Vienna today. As a result, relying on positive rhetoric, oil prices may spend the day in positive territory, waiting for fruitful decisions. Most likely the participants will agree on the extension of the existing production quotas. But some of the Russian producers have already expressed doubts about the possibility of cutting production due to seasonal difficulties, for example, Lukoil. After the statements from Oman delegates that decline in production could be as low as 1 million barrels, prices fell. This may indicate that the market expects more serious concessions from OPEC. The growth of commercial inventories in the United States so far effectively prevents the growth of positive sentiment in the oil market, which, moreover, is gradually accepting the hypothesis of a global slowdown in demand. In such conditions, output cut is an obvious necessity for OPEC, but the whole question is how much the members of the cartel are willing to sacrifice in order not to infringe upon their national economic interests. Yesterday there were reports that Huawei CFO was detained in Canada on request of the US. The part of the market that has relied on the rapprochement of China and the United States after the meeting in Argentina is likely to start correcting its wrong hopes, this can now be seen from the fall of US stock futures. SPX, with ease, punctured the 2,700 mark down, Wall Street is likely to hold in sales today. A top manager of a Chinese company is awaiting extradition to the US after being detained on the first of December, that is, before Trump and Xi meeting. Most likely, the reason for the arrest was the involvement in the sale of HP equipment, to the sanctioned Iran. It is unlikely that Trump did not know about this and did not authorize the detention, so he won’t be able to portray a surprise. And if he knew, the reaction of the markets was easy to predict, the fragile expectations due to the uncertainty with the tariffs only increases the amplitude of the negative reaction. The costs of creating additional tensions with China are high, so the reason is serious, and the dust will not be settled down quickly. The short trade of the S&P 500 now looks like an easy bet as the truce in a trade war can easily be broken. The Fed released the Beige Book on Wednesday with pretty rich content for even polar interpretations. On the one hand, the number of references to the word “tariffs” decreased from a peak of 51 to 39 in December, on the other hand, the number of references to the word “slow” rose to the highest level in 2018. The frequency approach to analyzing the content of the Beige Book is justified by the fact that the Fed gathers anecdotal feedback of company managers, economists, market experts from different US districts about economy situation in the country. The citation of some actual words allows us to assess the general mood of the respondents. A short guide: How to use data on the T-bills to estimate future Fed rate hikes? Amid growing jittery that the Fed made a mistake picking up the quarterly pace of rate hikes and reluctantly admits its flaw, the US term structure of interest rates earns back the status of a “reliable predictor” of a looming slowdown. Recently, I wrote about how the spread between 10-year and two-year bonds portrayed extreme distrust of the Fed’s policy in the medium term, but today I would like to speculate about the even shorter timeframe of the Fed’s actions. With the December meeting approaching and keeping in mind the quarterly pace of rate increases by the Fed, it is curious to see how the yield of 1-month and 3-month Treasury bonds behave together. If we assume that inflationary expectations in the short-term interval are roughly equal (i.e. only Fed decisions affect their yield then), comparing their yields, we can put forward a guess what the bond market thinks about the Fed meeting in March, which corresponds to the supposed quarterly increase in the rate. The last auction of 3-month bonds in the amount of 39 billion was held this Monday, while the auction for the 1-month ones was held on Thursday. It is noteworthy that the yield to maturity of both terms was about the same. Since the market is highly likely to expect a rate hike in December, convergence in yields of 1-month bonds with 3-month (which YTM basically focuses on the March decision) means that the expectations for a rate increase in March gradually leave the market. After all, if the opposite were true, the demand for three-month bonds would have to fall, which would be expressed in the increase in YTM (yield-to-maturity). Of course, you may not bother with the details of yield movements and just look at the probability distribution of futures on the rate hike. The chances of a rate increase in March to the level of 250-275 dropped to 33%, although only a month ago the probability of the increase was 50%. And certainly, what will not leave the Fed indifferent is the inflation expectations (albeit measured through inflation-linked bonds), which did not last long at the desired level of 2% and began to dive. The latest data shows that inflation expectations, measured “through the consumer” (for example, from W. Michigan), also slightly slowed down. The problem is that they are more likely to be lagging (considering that the consumer is less aware of the trend in economy) than the leading inflation expectations measured through the demand for bonds. On the other hand, we can’t rule out that the market reaction to what is happening in the economy can be irrational (for example, to the effects of tariffs), which then spreads to other agents (firms, consumers), and positive loop feedback only enhances the effect. The Fed is now trying to stabilize expectations and particularly illustrative for this are the comments of the President of the Federal Reserve Bank John Williams, who said recently that the Central Bank cannot react to every whim of the markets. In general, the following situation arises: the market prices in one incomplete rate increase in 2019 and the beginning of a new easing program (QE4) in 2020. Then the Fed will have to begin to soften credit conditions in the economy, as expectations of a new wave of recession rise due to fading fiscal impulse, the effects of trade tensions and a seemingly deadlock state in the oil market. In the short-run, hopes to remain for wage growth, data on which will be released today. The monthly wage change is expected to be at the level of 0.3%, the number of jobs – 198K, unemployment – at the level of 3.7%. The Asian and European markets rose on Wednesday thanks to positive comments from the US president regarding the trade deal, freeing Huawei top manager Meng on bail. The major source of gloom remains the risk of ousting British Prime Minister May, what threatens to thwart Brexit plans. In an interview with Reuters, Trump said that the US government is conducting trade negotiations with China over the phone, and the new tariffs will not be introduced until certain results on the deal appear. Trump decided to intervene in the Huawei case, under with the provision that non-intervention poses a threat to national security. This moment has yet to be clarified, but even now it allows the markets to downplay the risk of an escalation of the conflict with China. A Canadian court decided to release Meng on bail, although, according to tentative information, he refused to do so, given severity of the charges and difficulty of determining the correct amount of bail. Keeping Meng in custody forced the markets to include the consequences of China’s “stern response” in the asset prices, but now it allows them to count on positive developments, in particular, on the trade deal. The news background has improved enough to allow global markets to start trading on Wednesday with a correction, after a weak start at the beginning of the week. The MSCI broad Asia-Pacific index added 1.2% on Wednesday, while the positive attitude was clearly visible on the Chinese stock market. China has already shown the will to cooperate, considering the reduction of tariffs on car imports from 40 to 15%. On the other hand, it can hardly be called a serious concession, given that the authorities are trying to boost consumer demand in the context of weakening the main driver of growth – production. Negative expectations regarding the trade deal are fueled by news that several state agencies in the US are going to publish a report on China’s wrongdoings ​​in commercial espionage and hacking. On the other hand, the government already has this information, so without specific consequences (for example, sanctions or indictments) the publication of evidence is unlikely to lead to an escalation of the conflict. In the foreign exchange market, the pound sterling is down to the lowest level for 20 months against the dollar amid speculation that the conservative party may put forward a vote of no confidence in May. The likelihood of such an outcome increased after May moved the vote on Brexit, fearing its failure. In the event that May loses her seat, a supporter of hard Brexit will probably come to power, who may even initiate a second referendum. The pound is significantly oversold and barely holds above 1.25 on negative expectations, so any news about the trade-off will allow the British currency to materially strengthen. Consumer inflation data for November are due later today. There is a significant risk of a negative surprise, considering that the data on wage for the past month did not meet expectations. Wage growth increased by 0.2% in November against the forecast of 0.3%. The early weakening of pressure in prices will strengthen speculation that the Fed will postpone rate hikes in 2019. The chances for the March rate hike are low, currently staying nearly 26%. Oil prices rose after the API data pointed to a significant (-10M) decline in US commercial reserves, suggesting that a sharp decline in prices forced producers to slow down production pace. WTI rose cautiously on Wednesday by half a percent. According to KPMG, retail sales increased by 2.2% last month, after lackluster December, the weakest for 10 years. Barclaycard figures also showed that card spending rose by 2.9%. According to the company report, buyers made holiday purchases in advance in November to take advantage of discounts. Sacrificing Christmas traditions to the desire of saving by conservative Britons speaks either of a drop in the income or greater risk aversion associated with leaving Britain from the EU. The second option is more likely, since the incomes of the British are growing at a pace higher than inflation. As a result of the “raid on the franc buyers camp”, USDCHF jumped from 0.9% to 1.0096, but after having completely eliminated the effects of the movement, having gone below 1.000. CHFJPY was losing less, about 0.4%, EURCHF also reached 1.14081 for a very short period of time, before returning to the previous equilibrium range. The recovery of the franc to the pre-crash trading range ​​hints that the drop was not driven by some shift in fundamentals, i.e. it was not preceded by the release of any important news or events. Asian markets started the week at minor loss, as in the last week they didn’t get favorable updates on the course of negotiations between the US and China. Trump tied market expectations to his own will, saying last week that only a personal meeting with Chinese leader Xi would be able to resolve major trade differences. It is also curious to observe the movement of the mainland and offshore yuan today. Despite the sale of the mainland yuan to 6.78 per dollar (+ 0.55%), CNH, on the contrary, increased, although it is usually more sensitive to negative expectations, if any. The reference rate was set today at 6.7495. The Chinese are celebrating the lunar new year, which is traditionally associated with an increase in consumer spending, which means an increased demand for cash, so the PBOC probably is now taking appropriate measures to fill banks with liquidity. It is worth considering this as, the factor pushing the yuan lower, and behind it the gold. Recently, a correlation has reappeared between them. This week, there should be data on monetary aggregates and lending rates in China, which will shed light on the implementation of plans to stimulate the economy in response to a fall in export and production growth rates. Global risk aversion may increase this week if export and import data for January does not meet expectations in China. I remind you that now, China’s trade with partners is experiencing a kind of “exhaustion” after Chinese firms rushed to ship goods in the third quarter of last year to avoid tariffs. Then, export grew amid reduced production volumes and it is clear that the business inventories were the “fuel” for export growth. The pace of their refilling is likely to have a negative impact on export statistics in January, as well as in the following months. The European Commission last week sharply lowered growth forecasts for the Eurozone this year and next, Trump said he has no plans to meet with Xi before March 1, i.e. the date of introduction of new tariffs. That automatically makes relevant the scenario of a new round of tariffs. As a result, the dollar returns itself the status of the best safe heaven out of the worst that it is likely to use it this week. When everybody sells, who buys? Who is supporting the US equities now? The US stock market and the Chinese yuan soared on rumors that President Trump is considering the option to move the deadline in negotiations with China, presumably by 60 days. In Twitter, Trump was deliberately reluctant to shift the deadline, saying that his decision is subject to the progress in negotiations. On the one hand, Trump’s announcement is a bullish signal, since in fact the new round of tariffs will be postponed, on the other hand the delay means that the progress of trade talks is basically in the same state as it was 2 months ago. Also, the effect of 10% tariffs will last more and the possibility of their early end (that is, the first of March) becomes a less realistic outcome. One of the few leading indicators of sentiment in global trade is the Baltic Dry index. It is an aggregate estimate of the cost of transporting raw materials by sea. With the introduction of US tariffs last year, the index began to slide, reflecting the slowdown in global trade, and since January, the index decline has accelerated as the possibility of trade truce has remained extremely unclear, despite the flow of assurances from Chinese and American officials that they will make every effort to strike the deal. The Index movement also depends on oil prices. If fuel costs are reduced, the freight is also getting cheaper. Therefore, part of the downward movement in the index is due to drop of prices in the oil market. The US stock market finds itself in an interesting position. According to Bank of America, all three groups of investors – hedge funds, professional and private clients have been net sellers of stocks for the past two weeks. From a set of investment alternatives, stocks in the US stock market were considered the worst for all of January, while sovereign debt of emerging markets was the most preferable. Nevertheless, the US stock market was not only able to recover from a fall but made unprecedented upturn since January 1987. Since the beginning of the year, the S&P 500 dynamics have become the second in terms of recovery rates since 1990, earning investors more than 10% of capital gains in less than a month and a half. A reasonable question arises: who buys when everyone sells? There is one driver which was in the lead last year and will probably be the basis for a stable (or even bullish) market in 2019 – share repurchase. Last year, the managers had been backing market caps of their firms burning almost $1 trillion (including money received through tax breaks). But since the beginning of this year, the companies have already spent 78% more funds to repurchase shares than they did in the same period last year. Investors also prefer share buybacks instead of dividends, since capital gains are taxed less than dividend payments. Thus, US law encourages long-term investment in the stock market (after all, return on capital is “more deferred”), and for companies this is less stressful in decision-making because the dividend policy is a less flexible tool to reward investors than repurchase (usually, increasing dividends is a “commitment” to maintain them at a new level for a long time). Directing retained earnings to share repurchases also means the lack of investment prospects from companies what is another sign of the coming weakness in the future. It seems that the return of the S&P 500 to the lows of 2018 and the QE4 from the Fed could only a matter of time. Several ECB policymakers made comments on Friday and Monday that were disappointing for the euro. On Friday, Benoit Coeure, a member of the ECB’s executive committee responsible for markets, said that the European banks may need additional money injections in the form of a fresh TLTRO round. In simple terms, these are long-term loans to banks at a preferential rate, which banks must then direct exclusively to lending to households and firms. The first round of TLTRO was held in 2016 with 4-year maturity loans, the money was received by banks that showed “distinguished” lending performance, instead of a search for arbitrage opportunities which ECB of course doesn’t appreciate. TLTRO is essentially a channel for the transmission of monetary policy, because a decrease in the ECB rate should be conveyed to the economy as lower loan rates, but banks are not always interested in this, since a shrinking interest margin forces them to hunt for yields and the economy with weak demand for loans or ability to repay loans (higher risks) is not profitable “point of delivery” of cheap money. Earlier, Draghi complained that banks used “targeted” credit money for other needs, so they won’t be in a hurry with the new TLTRO. At the last meeting, he declined to discuss a new round of such funding, which disappointed the banking sector. Now, a turnaround is looming on this policy measure, and this may mean that the ECB will sacrifice with its efficiency as the growing slowdown in the economy and the deterioration of growth forecasts require additional easing actions. Coeure also noted that the ECB’s economic slowdown is becoming “clearer and broader” and the inflation trajectory is also at risk. Monetary policy should “adapt” to new challenges, he said. After Coeure’s comments on Friday, the euro went down sharply, touching on the 1.1250 mark against the dollar, but paring losses by Monday, bargaining around the 1.13 mark. The stock index of banks from Euro Stoxx also strengthened on Friday, bringing the weekly growth to 4%. ECB Governing Council member Villeroy said on Monday that the slowdown in the eurozone economy is becoming significant, so the monetary policy guidance may change if it turns out that the nature of the downturn is persisting. The weakness of the economy came as a surprise to policymakers, since Italy was already entering recession, and Germany barely escaped this fate. Responding to a question about whether weak economic reports would be a reason to reduce the rate, in an interview with the Spanish newspaper El Pais, Villeroy said that if the data indicates a steady recession without a rebound perspective, then a change in the rate is possible. So, already two officials of the ECB expressed the opinion that economic challenges may require a U-turn in the policy. It should be noted that, according to previous statements, Coeure is distinguished by a hawk-like approach to politics, while Viléroi takes the position of a “centrist” with “dove” elements. Based on the negative reaction of the euro to the statements of officials, its growth against the dollar is under threat and the downward movement is likely to resume this week. Are Global Central banks in a “stealth” gold-buying mode? While the dollar is being dumped in the short-term presumably on expectations of a happy end to trade negotiations, and the yen is sinking after warnings from the head of the Bank of Japan, Kuroda, gold seems to be taking the opportunity to swiftly update medium-term peaks. Yesterday, yellow metal went up by $14 to $1,341 per troy ounce, and since November last year yielded almost 12% capital gains for lucky gold buyers. The recent rally helped gold to reach its highest level in 10 months. It is possible that gold has become a choice in the “broad-based rally”: since December, not only the S&P 500 has grown, but also the commodity market, including WTI, which has rebounded from the lower limit of the range of $40–45 and is now trading above the $55 mark. Other base metals staged even more impressive rally: take, for example, Palladium, which grew by almost 50% from August last year, overtaking gold in value in nominal terms and even reached a historical record amid slowing growth in supply and increased demand as an effective catalyst in automobile engines. However, the most curious fact which nobody can’t deny as a rally factor was the activity of central banks in the gold market. While we are focusing on the hourly updates of trade talks and Trump’s Twitter account, the world’s central banks are “on the sly” ramp up of gold purchases. The volume of purchases in 2018 grew by 74% in annual terms marking the highest level since the collapse of the Bretton Woods system. Seems that some countries hedged their national currencies from sanctions and their associated decline against the dollar. And what do you think about it? It is also possible that in the short term, gold is on the sights of trend-following algos, whose activity is enhancing each other and creates the effect of “self- sustained rally” the yellow metal. The immediate resistance of gold can be at around $ 1366, where unsuccessful attempts to break up in mid-2016 and early 2018 took place. The capital-labor tradeoff. Why US firms continue to hire? Orders for durable goods missed estimates in December showed data released on Thursday. November reading was revised upward (from 0.7% to 1.0%), which somewhat eased concerns, however, breaking down December report helps to see some worrying developments in the underlying trend. New orders, ex-defense – +1.8% in December, after being unchanged in November. New orders excluding aviation and defense industry – -0.7% in December, after falling by 1.0% in November. Now it’s clear where US firms saved to pour then money into stock buybacks, which keeps the American stock market from falling sharply. It is worth noting that the decline in fixed asset investments lasted for three months in a row (and maybe continued in January), which was the worst dynamic since the end of 2015, when China almost dragged the whole world into recession. There are rumors that then the dollar was weakened in order to whet the appetite for risk, which is known in the conspiracy circles as the “Shanghai Accord”. In addition to weak data on capital investments, the Fed gets an additional blow from economic conditions front. The index of manufacturing activity from the Federal Reserve Bank of Philadelphia fell from 17.0 in November to -4.1 points in December, which was the first negative and the lowest reading since May 2016. The decline was observed both in new orders and shipments of finished goods. The index of new orders fell from 24 to -2.4 points, while shipments index fell from 17 to -5.3 points. Monthly decline in new orders was the biggest since the 2008 crisis. Inflationary pressure in input prices for firms continued to decline. The corresponding index fell by 11 points to 21.8 and already only 28% of surveyed managers reported an increase in resource prices compared to 40% last month. Nevertheless, 33% of companies reported that they were able to raise prices for finished products, which, of course, is good news for profit margins. The employment index showed that firms continue to increase hiring. The corresponding index rose from 9.6 to 14.5 in February. A strong labor market and worsening economic conditions constitute a controversial picture in the US economy, but if we consider the increase in jobs to be a “forward-looking” decision, then the managerial economic expectations index, which turned out to be positive in February, is consistent with consistently high labor demand. It is quite possible that in the economy there is some rebalancing between capital-intensive and labor-intensive methods of production, since the rate of employment clearly exceeds the capital investment. According to data released on Friday, inflation in the eurozone eased in January, the rate of decrease was not as significant as preliminary data showed. The Eurostat report said that in January, the consumer price index (CPI) in the euro area rose by 1.4% compared with the same period last year. This is below the inflation rate of 1.5% in December. At the same time, compared with the previous month, inflation in January fell to –1%. The base consumer price index (CPI) in the eurozone, which does not include the prices of food, energy and tobacco, rose by 1.1%, against growth of 1.0% in December. The ECB struggles to boost growth of the price level, but it stubbornly stays below 2% goal. On Thursday, an economic conditions report that showed that business activity in the EU manufacturing sector recorded the steepest decline in six years amid concerns about Brexit and the slowdown in economic growth in Italy and Germany. The slowdown in economic growth in the eurozone forced the ECB to consider the possibility of introducing new financial stimulus measures. According to analysts, the European Central Bank in March will lower its forecasts for economic growth and will consider the possibility of starting the next round of targeted long-term lending operations (TLTRO). Inflated but stable stock market seems to be one the criteria of successful presidency for Trump, since he attempts to talk up asset prices in a rather unusual manner. Trump entered a debate with the main hawk of the White House, Robert Lighthizer on the essence of the Memorandum of Understanding, which both sides signed during the negotiations. During a meeting with a special representative of China, Liu He, which was broadcast on television, Trump was outraged by the non-binding feature of the document, while the Lighthizer tried to explain that this is a trade agreement that countries usually sign when they reach an agreement. Lighthizer eventually capitulated, assuring that he would no longer use the notion of “Memorandum of Understanding” and would call it a “trade agreement”. The Markets’ reaction to Trump’s positive comments on Sunday was even bigger after Trump’s public discord with the adviser which created the impression that Trump was again not satisfied with progress of the negotiations, as was the case last March. However, it seems that everything was OK this time. According to Bloomberg, the relationship between Trump and Lighthizer has cracked since the meeting of the leaders of the United States and China in Argentina. Trump then demanded that the negotiations begin immediately, but Lighthizer objected that China was not ready yet. Negotiations had to be initiated and Lighthizer hoped that the deadline of March 1 wouldn’t be extended, and weak progress would increase the pressure on China with the next round of tariffs. In general, Trump upset belligerent senators and White House officials with the desire to “get a fast deal”, because, in their opinion, the United States got enough leverage on China, which is losing in a trade war (based on the economic damage that both countries received). Trump’s attempt to calm the markets by hurrying his team in preparing an agreement may be a tactical mistake, as growing economic damage will reduce China’s bargaining power. In January alone, cash inflows to the economy amounted to almost $ 700 billion, which is comparable to Saudi Arabia’s GDP. Of course, this not only means a retreat of the government in the US trade war, but also a surrender in the fight against shadow funding, which was never completely suppressed. Officials from the central bank said that the acceleration of credit expansion is associated with the traditional increase in demand for loans in January. It is strange that on the social financing chart above there are no characteristic spikes at the beginning of previous years. Monetary stimulus in China and Trump’s optimism will whet the appetite for risk this week, so the pullback on risk-free assets, in particular gold, is likely to resume this week. Firstly, this is the result of the lack of other investment instruments and undeveloped financial markets. Secondly, the fiscal budget of China’s municipal authorities strongly relies on the proceeds from the sale of land and they use future revenues from land sale as collateral for financing by the government. Third, firms use real estate as collateral for loans, and therefore also prefer to keep it as an asset. But well, for Marxist-inspired Chinese officials, ghost cities can be simply a part of long-term government plan. The process of urbanization in China may not be fully based on market signals (i.e. prices), since the rapid increase of urban population can be a strategical goal for the government. Command methods can prevail in the block of macro-decisions, including regulation of the process of migration from villages to cities. The question is how long the state will be able to bear the burden of illiquid housing stocks. Taking into account the behavioral factors of the Chinese, investment needs, as well as speculation motive, the government attempts to stabilize real estate market which are accompanied by a strong amplitude of price fluctuations, as can be seen on the chart above. On the one hand, depriving the public of the fancy of endless price growth easily triggers a chain of panic sales, and demotivates potential buyers, including speculators (a sharp bias towards supply). On the other hand, the rise in prices as a result of artificial absorption of the supply by the government forces young buyers out of the market but begins to attract speculators. Recent decline in production activity, in turn, can be reflected in a decrease in the demand for rental housing, which can be an argument for potential rentiers to sell the house, increasing pressure on the market. Once a major buyer of housing in the province of Bengbu became the government, speculators were quick to jump in benefiting from state guarantees what drove prices up quickly. The program for buying out illiquid housing is planned to continue up to 2020 in 200 cities, but in cities with obvious speculative trends, such as in Shanghai, the right to determine prices is granted to the market. – Prices in developed cities are falling, the discount from developers reaches 30%. It is obvious that China will have to continue to bear the burden of the “principal-agent” problem, which seems to be eternal for the command economy. Preview of the upcoming ECB meeting: Are new TLTROs necessary or not? From the beginning of the new year, when it comes to the ECB policy stance, the discussions most often focus on the reasons, conditions and design of a new round of TLTRO round, long-term bank financing operations. After the massive asset-purchase program ended in 2018, basically meaning that ECB opened a new chapter of policy normalization, economic conditions in the Eurozone suddenly deteriorated as shown by numerous negative surprises in manufacturing and services PMI reports. This prompted the ECB to taper off rate hike discussions completely, while raising the need to offer some flexible easing measure to confront the downturn. The “candidate” supported by ECB members and markets which has reasonable impact on financial conditions and is safe to discuss in the current situation is TLTRO. It looks like that the ECB got some clues from Fed’s pessimism in January, which suddenly changed its tone in January due to the pressure of negative market expectations. Several ECB board members said that the economic slowdown may be stronger and longer than previously expected which shifted expectations for a rate hike to a more distant future, at least until 2020. At the last meeting, the ECB described risks as “tilted to the downside”, as compared to the previous wording “moving to the downside”, i.e. raising the degree of gloom relative to the pace of economic recovery. However, at the press conference, Draghi limited the impact of the bearish statement saying that the reassessment of economic conditions would not have monetary policy implications. On the front of ECB policy decisions, there is a consolidation of views that banks will probably need a new round of cheap funding (TLTRO). According to the latest data from Handelsblatt most members of the expert community, referred to as “ECB Shadow Council” considered that the ECB should extend long-term financing operations in order to maintain control over financial conditions, preventing their unwarranted tightening. It should be noted that the purpose of the community comments is to determine the preferred behavior of the regulator, and not to predict its decisions. At the last meeting of the ECB, the inflation forecast for 2019 was lowered from 1.6 to 1.4% and remained unchanged for the next year at 1.5%. A useful indicator of the ECB’s readiness to continue normalizing policy will be the updated forecast for 2021. Lowering the long-term forecast means recognizing by the ECB that inflation is moving away from a convergence path with a target of 2%, which implies incline towards the measures. Within the limits of existing opportunities, this means a signal for a new round of TLTRO. At the last meeting, the ECB expected inflation to be 1.8% in 2021, and GDP – 1.5%. Forward guidance with respect to rates is unlikely to change at this and subsequent meetings without visible signs of economic growth, so as not to complicate decision-making for the new head of the ECB. Recall that that Draghi’s term ends in the end of October this year. The ECB rhetoric after the last meeting is full of doubts, both among dovish and hawks. Benoit Coeure admitted that the growth momentum is becoming less and less pronounced, the trajectory of inflation is less distinct, a new round of TLTRO may be needed and this point is included in the ECB agenda. Chief economist Pratt said that the short-term outlook is not particularly bright, but there are positive signs in the medium term. Ewald Novotny, one of the most eminent hawks of the ECB, said that the reasons for the slowdown in the economy can be transient and TLTRO should be probably delayed. He also noted that there are some discrepancies between market expectations and the ECB guidance, most likely pointing to an underestimation of the chances of a rate hike in the future. Draghi, speaking to Parliament, said that a significant monetary stimulus for the economy remains a necessary measure. Here are the scenarios of the meeting and the possible reaction of EURUSD and European bonds according to ING. US trade deficit soars to record highs at the expense of the government? The US trade deficit updated the record in December, official trade data showed on Wednesday. Strong consumer demand and tax cuts were essential factors of import immunity to the impact of import duties, but US exporters also failed to secure sales due to counter-tariffs, which increased the skew in foreign trade in favor of imports. Trump’s protectionist policies, judging by the US trade with the rest of the world, produce results that are directly opposed to the stated goal of restoring the trade balance. The US Commerce Department reported on Wednesday that the trade deficit jumped 12.4% in December from the previous month. Last year, imports surpassed exports by $621 billion, which is 12.5% more than in 2017, making it the highest figure since 2008. Considering the change of the US budget deficit, which grew by 77% over the period October-January compared with same period of prior year, it is likely that the United States paid for the growth of the trade deficit by increasing the public debt. Decline in exports by 1.9% in December in monetary terms amounted to 59.8 billion dollars, which was the worst change of US trade since October 2008. Imports in December increased by 2.1% compared with November. By adjusting the data for inflation, the increase in the trade deficit amounted to 10 billion dollars. Growth in the real deficit may indicate that the revised estimate of GDP growth in the fourth quarter of last year may be less optimistic with a preliminary estimate of 2.6%, published last Thursday. US importers sought to increase stocks of goods for sale in response to the imposition of tariffs, fearing that the escalation of a trade war would lead to a chain of tariff increases and a subsequent rise in import prices. The trade deficit with China increased by 11.6% to a historical record of 491.2 billion dollars. The Trump administration introduced tariffs for steel, aluminum, solar panels, and washing machines, but as a result received a record import of goods from 60 countries, the leaders of which were China, Mexico and Germany. Nevertheless, tariffs also led to a positive export change, which rose to 1.7 trillion dollars in 2018. For the last three months, exports have declined due to tariff restrictions from China, a slowdown in the global economy and a strong dollar that reduced the competitiveness of American goods. The dollar has slightly changed against other major currencies on Wednesday, while the yield of Treasury bonds declined ahead of the ECB meeting today. With the data on foreign trade for February, China has decisively emerged as the leading source of gloomy economic headlines. Exports in RMB fell in annual terms by 16.6% against the forecast of 6.6%, imports grew by only 0.3% against the forecast of 6.2%. In dollar terms, the data is even more disappointing. At first, Bloomberg “refused to believe” in the scale of the fall, mistakenly reporting an increase in exports by 16.6%, but quickly corrected the data, adding a minus sign. Algo traders were probably left with the bad taste. Part of the decline can definitely be attributed to the seasonal factor, namely, the celebration of the Lunar New Year, which began 10 days earlier than last year, probably propping up shipments in January and leaving a negative print in February. The rebound in manufacturing PMI from 48.3 to 49.9 points in February, in light of the significant downturn in foreign trade, has slightly lost its relevance in assessing the state of the Chinese economy. In dollar terms, exports crashed by 20.7% YoY, while imports fell by 5.2%. The trade surplus was $4.12 billion, Chinese customs reported. Looking into the past years of exports and imports data, the role of seasonality looks pretty convincing, making the February figures not so much frightening. Strong trade downturns at the beginning of the past years suggest that the trade prints in coming months should help to understand February decline better, especially whether it was a seasonal quirk or heavy blow to world trade due to domestic issues or decline in consumer demand in the economies of major trading partners, such as the United States. Despite the “commitment” of the US and China to constructive talks, the trade war seems to be unleashing in full swing. As can be seen from the chart, China’s imports from the United States fell at a record pace – more than 40% compared with February 2018. This explains the record increase in the US trade deficit, which was published yesterday. The decrease in exports was also accompanied by a strong drop in imports from the United States, so if anyone benefits from Trump’s protectionist policies, it is China. In contrast, imports from the EU increased by 5.8%, according to Chinese customs data. Reducing imports from the United States can significantly affect the layoffs and the creation of new jobs in the US manufacturing sector. This will probably happen with a delay, as US factories will need time to adjust. In January, the PBOC announced a giant injection of liquidity into an economy, which amounted to 4.6 trillion RMB in the form of various forms of loans (including through shadow banking), explaining its decision with rising liquidity needs in the economy. The manufacturing sector responded poorly to stimulation, hope remains for rapid growth in the service sector.